As I recall, the original proposal called for two rinks in a facility that contained seating or bleachers for only about 150 persons. Apparently, the newest proposal calls for increasing seating by a factor of at least ten. I wonder if the fact that the Big 10 conference is one short of members with a hocky team would have any impact on building a facility that would support a hocky team fan base…just a thought. You may be right… until someone explains the cost increase, it’s impossible to know what has happened though. I know this is an old topic, but I was hoping you could shed some light on this ice center. I’m one of many hockey enthusiasts in this city who have hoped this new ice center would have been built by now. The costs have gone up 100%, from 11 million to 24 million, and from what I understand, the foundation is now talking about putting this rink near the Haymarket Park baseball stadium instead of in the downtown Haymarket area. Honestly, I’m starting to have my doubts that this will ever get built. It’s crazy to think a city of this size does not have a facility with year round ice. I’m still not happy that this rink was held hostage by the arena vote. If you go back and read some of the early articles, the city and UNL planned to open it by February 2010. Over one year later, and they haven’t even decided where to put it. Very frustrating. Thanks for letting me vent. If you have any information, I’d love to hear from you. I agree with Tim on this one! We need the ice rink to be built as a useful structure not a large expensive arena. skaters in Lincoln for hockey and figure skaters. We continue to have skaters choose to skate with Omaha and Fremont teams since we cannot get many more skaters on the limited ice times that we have now. 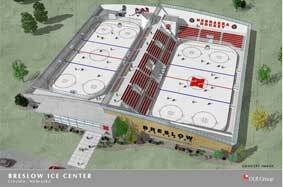 What Lincoln really needs is a simple Ice Rink that has seating for 500, 4 locker rooms and ICE. We will be able to bring teams into Lincoln for tournaments 2 to 6 times a season with such a facility. The money is there for this type of project now and the remainder could be in a trust fund to support its operation. We need to get something moving on this project before the money goes away!